Recently, when I visited Coffee Division, in Southeast Portland, I had the best shot of Stumptown’s Hair Bender I have ever drunk. As a general rule, I avoid using superlatives (especially with Hair Bender, with which I have a complicated relationship), but in this case, the shot deserved it. The barista nailed it. The first sip was bright and tangy, as expected. The bold acidity quickly mellowed out into a caramel-berry-chocolate silk finish. It was smooth, and reminded me why so many Portlanders swear by Stumptown coffee. The barista who made my expectation-exceeding shot was Chris Larson, the new owner of the café. If you live near Mississippi or Hawthorne, you might recognize Larson from Fresh Pot, where he worked for several years before getting out of coffee for a while. A few months ago, he decided to get back into coffee, so he opened Coffee Division—with a mission. “I started the coffee shop because I wanted to share my knowledge of coffee with others and feel like I was a part of something bigger,” he told me. I asked him how he managed to make such a great shot. He implied that it was part skill and part luck. It was clear that he appreciated the difficulties of making a great cup of coffee. One thing that makes Coffee Division different from most cafés is that all of the house coffee (roasted by Stumptown) is brewed using a Chemex. Larson and his wife, who also knows coffee well, having spent a decade working for Stumptown, chose to use the Chemex over the French press because they wanted a cleaner, lighter cup of coffee. They were willing to sacrifice some of the body for a cup that really features the flavors of the beans and nothing else. Larson said that since he has become a shop owner, he is more aware of opportunities to teach customers about quality coffee. Coffee Division’s café space has two distinct parts to it. The first part has several tables and the coffee bar in it. It was the area where people seemed to sit and chat over coffee. The second part, which was inhabited by several Laptopistanis, used to be a separate store until someone cut a hole in the wall to expand the cafe. Most of the tables in the second room have outlets next to them, so if you want to spend an afternoon working on the “next great American novel,” you won’t run out of battery while trying. Futuristic paintings by George Perrou, this month’s featured artist, hung from the walls throughout the café. The artist’s distinctive paintings remind me of the cartoon The Jetsons, in a good way. 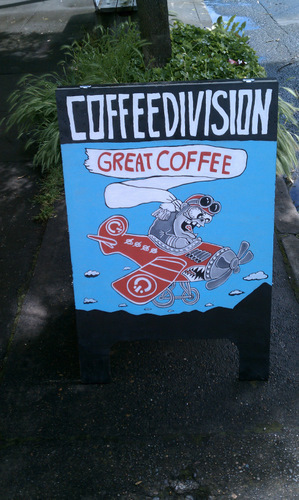 If you go to Coffee Division, be aware that Division Street is a busy street. Through the café’s large front windows, you notice the traffic and the Tri-Met buses frequently rumbling by. The noise and movement can be distracting, but if you are in the middle of an engaging conversation or have some earphones, you won’t be bothered too much. Coffee Division turned out to be a good find. I plan to go back sometime to see if I can get another great shot of Hair Bender. Maybe I’ll even get to break out the superlatives again.